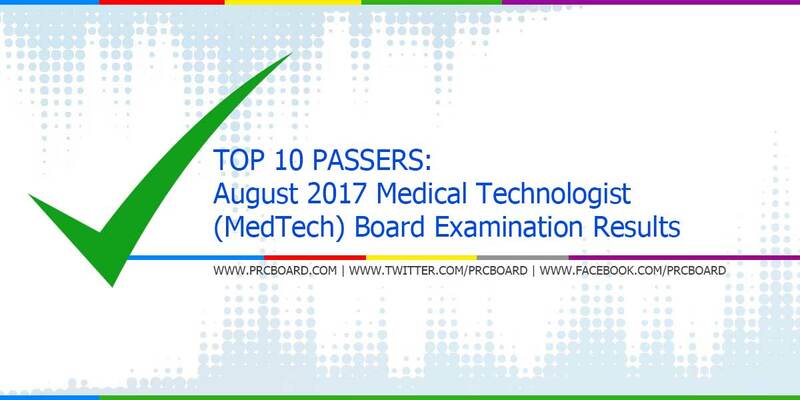 The August 2017 MedTech board exam results, conducted by PRC’s Board of Medical Technology are released three (3) working days after the last day of board examination. Aside from the official list of passers, top 10 examinees, top performing schools and performance of schools are also posted. Below is the complete list of MedTech top examinees, courtesy of PRC. While most examinees are asking about the possible release date, as mentioned in the main page of this article, it will be out by August 31, 2017 (Thursday). Meanwhile, the specified date is just target/ estimated timeline, results may be released earlier or later without prior notice. what time po result ng sa medtech? Ou nga po what time result po? My goodness. Wew. what time po ang release sa medtech passer? Pioneer people this is it! What time po result Mt? Praying for you, sister in law!! Eto na ba ang final listings ng mga pumasa? Final na ba to?